Like so many of New York City’s scene-iest nightlife destinations, Brooklyn’s House of Yes operates in a sprawling, former industrial space on a quiet street. Or rather, a once quiet street. 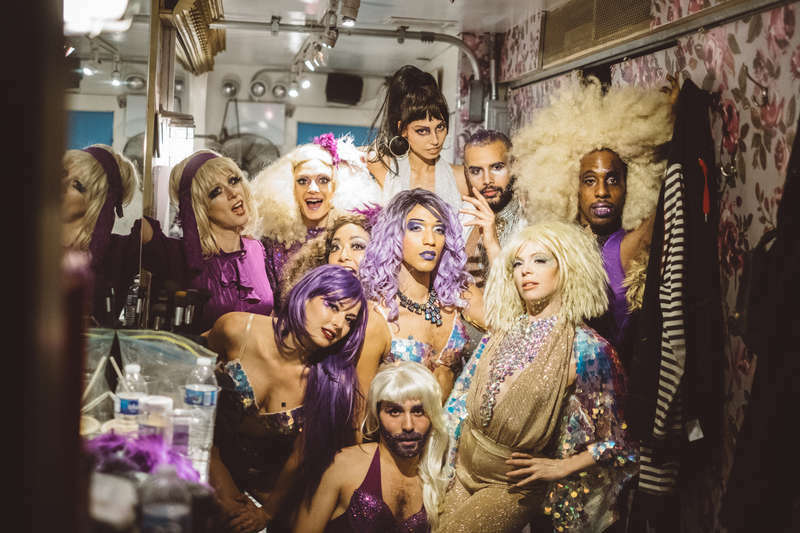 Part event space, part circus, part dance hall, and part community hub, HoY, as it’s known to its regulars, is a destination for sparkling mermaids, space pirates, and drag acts. Founded by performance artists Anya Sapozhnikova and Kae Burke in a Ridgewood loft in 2007, HoY outgrew three previous locations before landing its forever home. “This place is like a house party that takes place in a dream -- what I wish the world were like,” says Sapozhnikova. 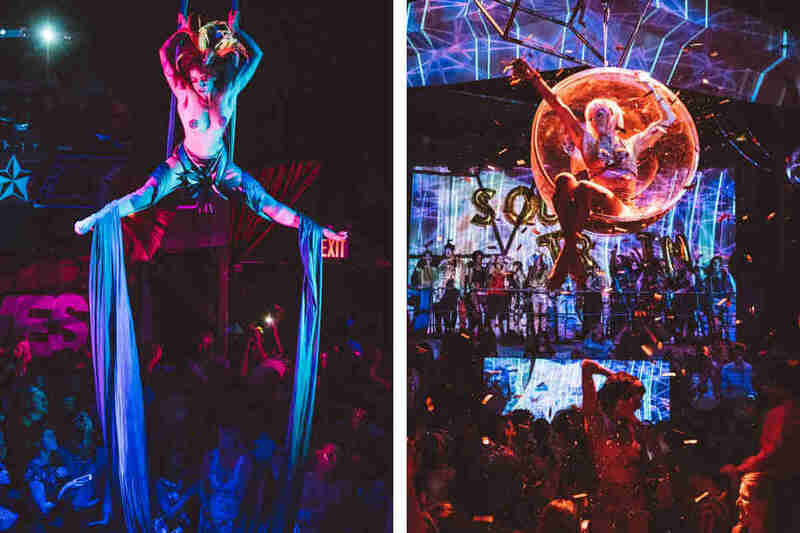 On some nights, it’s a theater, showcasing trapeze artists, stilt-walkers, and fire-eaters. On other nights, it’s a forum for community discussion and consent politics. On others, it’s a classic dance club. 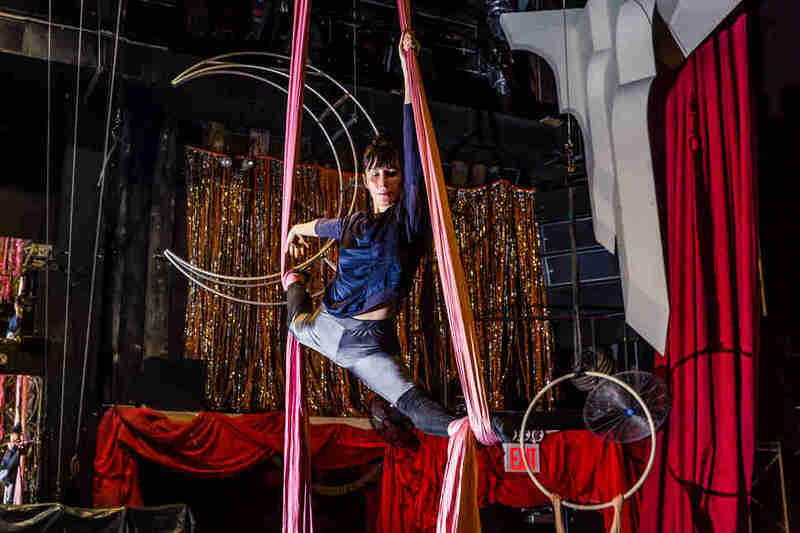 Its signature aerialists have been a consistent attraction over the years -- preternaturally beautiful performers who float through the air like jellyfish in a disco sea. For devoted audiences, their near-nightly shows are a respite from the ordinary. 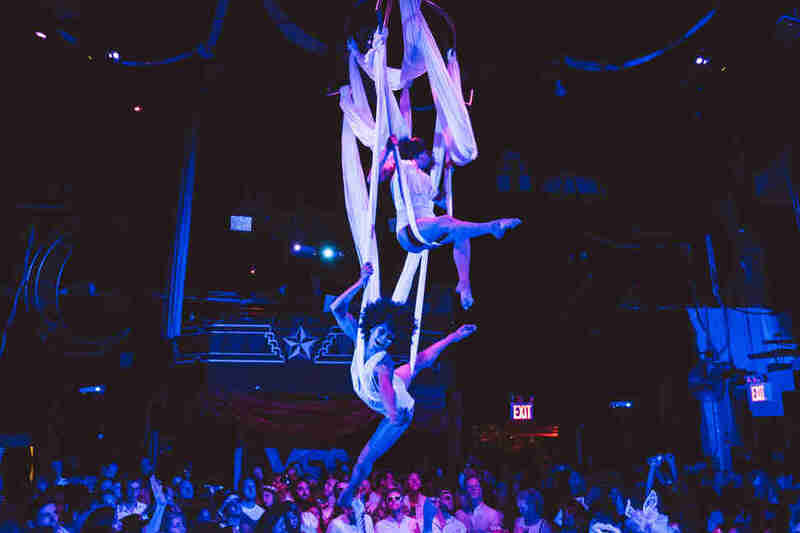 For House of Yes’s aerial stars, it’s just another day, or night, at the office. 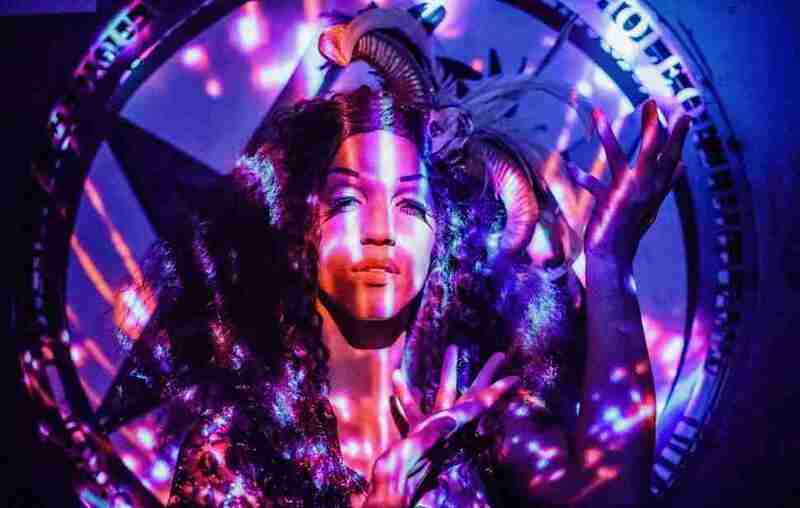 After midnight any given Saturday, a line of excited revelers, some draped in feather boas or wearing neon pixie-cut wigs, caked in glitter or sporting muslin fairy wings, begin streaming into the converted space on Wyckoff Avenue in Bushwick. Their jittery attention drifts upward, where aerialists clad in crepe-y bodysuits dangle, intertwined, from a silk rig hung from the ceiling. Twenty feet above the dance floor, they grasp toward one another, somersaulting through the air while beaming down at the jiving crowd below. They seem to float. On a quiet afternoon -- long after showtime, closing time, sunrise, and rest -- the venue is unrecognizable from its frenetic weekend scene. The cavernous space is empty, void of the glitter clouds and the glowing, frenzied mass of bodies that populate the space during peak hours. Performers are stripped of their bejeweled corsets and knee-high boots, back on land obeying the laws of gravity in athleisure and loose ponytails. But before too long, they are back in the air, rehearsing the routines that delight their devoted fans night after night. A woman with cartoonishly sculpted biceps break-dances to music streaming through her earbuds. Sapozhnikova sands a legless piano nearby, sending microscopic sawdust into the air. In the center of the room, a sandy-haired man built like a Ken doll slinks up a glimmering silk rig secured to the ceiling. It’s like the acid-dream rendition of a gym-class rope. The team meets at least twice a week to run through old routines and craft new ones for near-nightly performances. The actors, dancers, acrobats, and fire-breathers choreograph their own scenes in a collaborative, freestyle process. They occasionally break for Middle-Eastern takeout, YouTube comedy, and Britney Spears singalongs. Each performer has a designated partner -- and the allegiances run deep. “You start to know someone else’s body better than your own,” says Ken doll Nolan McKew. A storage room sits beyond an enclosed patio space alongside the venue, littered with plastic palm trees and naked mannequins. “This is the famed costume closet,” Cascone says. 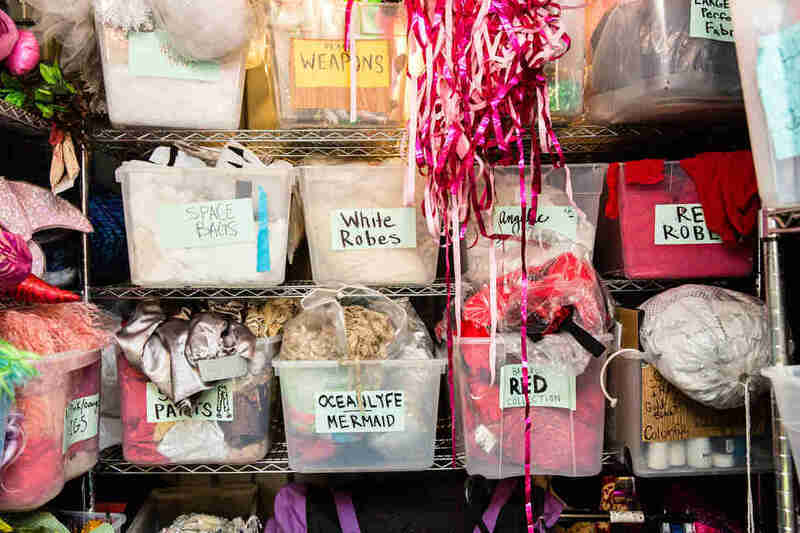 Inside, plastic bins overflowing with ribbons and sequined leotards line the walls. Each is stuffed beyond capacity, labeled in Sharpie scrawl: peace weapons, angelic devils, mermaids/ocean lyfe, boring bras. Pairs of mismatched shoes in a variety of sizes form a pyramid. A Viking helmet and a pink cape rest beside a shoe box stuffed with a tangled mess of safety pins, band-aids, hair clips, and earplugs -- an aerialist’s first-aid kit. Cascone calls it the “mom box”. The performers’ mirrored dressing room is small, but serviceable -- just large enough for a low counter and a smattering of stools. 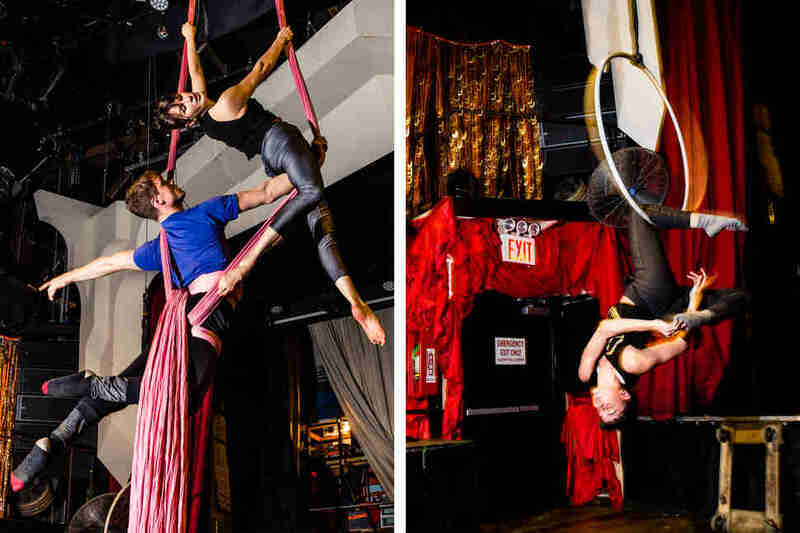 The precious prep area is shared with neighboring Queen of Falafel, which hosts hummus-lovers by day, and aerialists by night. “And I’m pretty sure we’ve all seen each other naked,” says performer Françoise Voranger, stretching just within earshot. Back in costume, lights down, performers gather backstage in a huddle before another night of spectacle. They shout praises at one another, hold hands, and jump up and down to harness the wild, contagious energy that House of Yes has become synonymous with. “We always get together in a big old circle, and jump and scream something together until we have all the energy we need to go out there,” Cascone says. When the proverbial curtain rises once again, the artists are studies in extravagance, suspended mid-air, glowing pink and blue and gold -- almost superhuman. Come dawn, they deposit their costumes in the enormous colorful wealth from whence they came. Stilts are traded for sneakers, and aerial rigs are traded for the Jefferson Street L train platform. The venue is swept clean, the lights dimmed. And all is quiet until the next show begins. Sapozhnikova’s dream turned out to be shared by many, and her audience continues to grow. “Our access to talent has increased, and our audience has gotten larger,” she says. “But the ethos is the same” -- that this place, with all its glitter, sparkle, shine, is what the world should be like. “In spite of the stress, we still manage to be playful and ridiculous," she says. Eliza Dumais can typically be found at ground level. Follow her for proof @elizadumais.